This model ran along an 8' length of track, brakes came on, engine stopped, expansion link changed position, brakes released, engine started in reverse direction until it reached the other end of the track when brakes were applied and engine stopped and then cycle repeated itself until model was turned off. Slightly "improved" by yours truly. 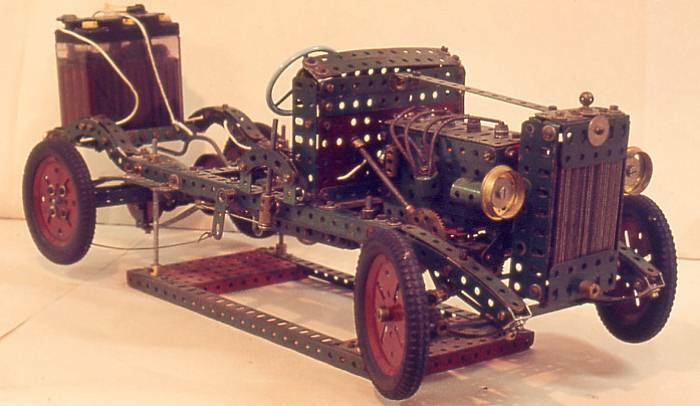 Powered by a 6 V. Meccano motor hidden in the engine block. The battery on the carrier is a modern Japanese m/c unit. With the help of the then MMG secretary, whose name now escapes me, I airmailed this model to him and he exhibited it for me at one of their meetings, after much repair work on his part as the vibration in the aircraft cargo hold effectively loosened all the nuts &bolts. This was not anticipated and much appreciated by me. The same thing happened on the return journey too! Fitted with "hydraulic rams" for luffing and rigged for remote operation. It was powered by 4 Emebo motors and is photographed showing a friend's son demonstrating its operation by putting it through its paces and preparing to pick up a cigarette box with the single cable grab using the remote control unit. This ran continuously lifting coal (dried peas) from the hopper and dumping them into the ship's bunker (return chute to the hopper) and completely mechanical in operation. It was powered by a mains motor and a cam controlled gearbox housed in the base and had a few "stunts" built into the mechanism to make sure that everything remained in synchronisation. This was very necessary to ensure that it ran reliably for hours during exhibitions and was a great crowd puller. Occasionally, if "little Johnny" ducked under the barrier and poked something, the resultant tangle was horrendous to behold but I became very good at rectifying everything in short order. 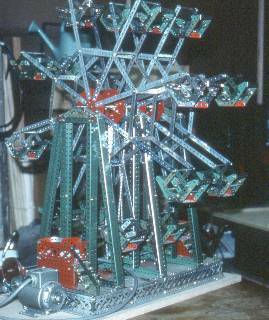 Of course it would be much easier to do with modern electronic control but it was a model of the mechanical age and I built it accordingly. 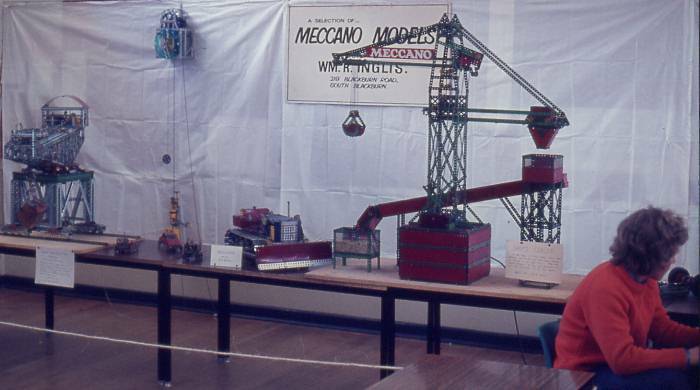 General view of part of a Meccano Model Exhibition which I mounted at a local private school. 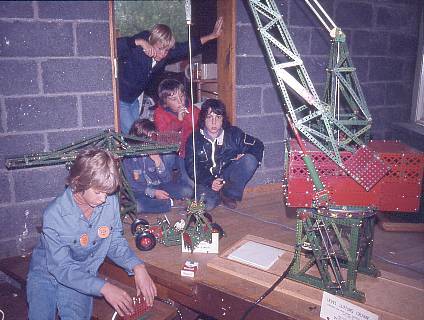 Another general view of part of a Meccano Model Exhibition which I mounted at another school. 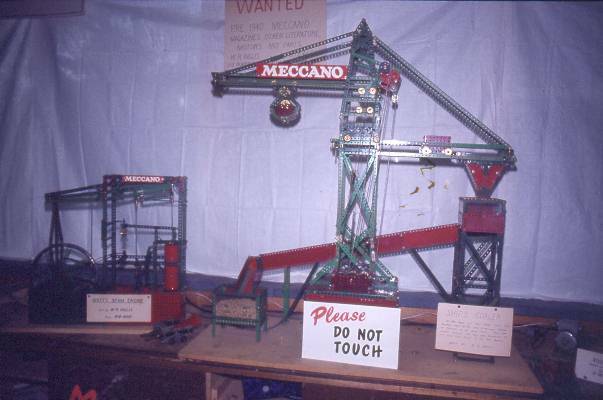 Still part of another general view of a Meccano Model Exhibition which I mounted at a school. As well as my Ship's Coaler, this view also shows my No. 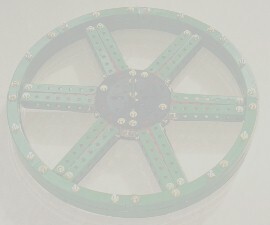 2 Meccano Clock Kit modified for continuous running and as written up in the Meccano Model Engineer under the caption of "A Good Idea for a Long Time". Two of my friend Keith Nicholls' models are also shown: A zinc SML 4 - Giant Blocksetting Crane; and a very good freelance model of a Bulldozer.